Simple to Make, Great to drink. And it simply goes on and on. Just save a cup to add to a new batch. Stays good in the fridge for weeks. We offer a real Ginger Beer Plant. To produce a "plant" the ginger must be fermented for a longer period of time. However it can and does make a refreshing and snappy semi-effervescent in a just a few days. Our Ginger Beer Plant is a Lactobacillus (bacteria) ferment as opposed to the more common Ginger Beer "Bug" . A Ginger Beer "Bug" is simply yeast. Common yeast, sugar and ginger produce a more carbonated and more alcoholic beverage. The longer you ferment the Bug the greater the alcohol. That may be as high as 5-6%, and where the "beer" is applied. 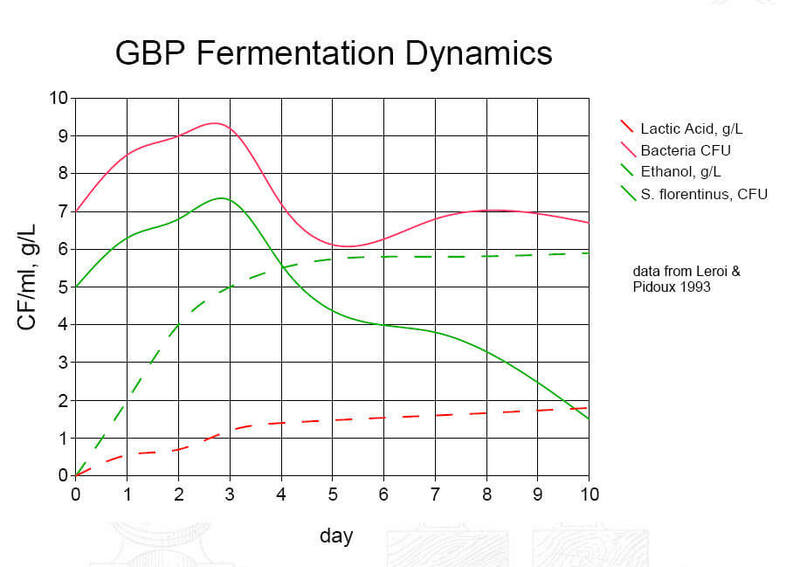 You can see from the chart below that a Ginger Beer Plant (Bacteria) produces beneficial acids and the longer the ferment the lower the alcohol - and the healthier it is. There is a clear health advantage to Ginger Beer Plant's bacteria ferment. Ginger Beer is easy to make. Making Ginger Beer with the live Plant takes a little bit longer than using a Ginger Yeast Bug that is because the bacteria ferment slower than do yeasts - but the health benefits are greater using bacteria. Otherwise the recipes are much the same. 2. Ginger. Roughly one tablespoon per quart. Adjusted for one's personal preference. 3. Slice of lemon. Fresh lemon adds nutrients and reduces the pH which help ward off pathogens. 4. 1/4 cup of sugar per quart. White sugar is neutral tasting whicle brown sugar, et al add different flavors and nutrients. Bring to a boil the water, sugar, lemon and ginger. Boil for a few minutes. Allow to cool to room temperature and then add the Ginger Beer Plant and 1/2 cup of previous brewed Ginger Beer. Stir / shake well. Cover with a cloth, set in a warm place for a few days. A tight cap will produce slightly higher amounts of alcohol and more carbonation. Beware that cap containers may explode.Using a cloth cover allows much of the carbonation to escape. To know when your Ginger Beer is done is by taste. As the sugar ferments the ferment becomes more and more sour. If your brew is still as sweet as when you started a week ago then its not working. It may be what is referred to as a "stuck ferment". You can try to place in a container with a tight fitting cap and shake well to add oxygen. Leave capped and if there's carbonation and pressure in a few days its working. If not its not active anymore. We guarantee your success, no worries. Save and store in the refrigerator for months. Even old flat Ginger Beer can be revived to a nicely carbonated richly rewarding elixir that the whole family can enjoy - with the UKeg64. Ginger is the most influential and widely used herb in the Shan Hun Lun written about 2,000 years ago and still revalent today. A slice of fresh ginger in warm water helps with morning sickness to stomach aches to food poisoning. Lemon is a great source of multivitamins and minerals. Ginger Fantastic Taste, I just love Ginger. One of Traditional Chinese Medicine most popular medicinal herbs. a digestive, laxative, antitussive, antiflatulent, and antacid preparations. abdominal pain and distention, and vomiting or diarrhea . Restores Yang: Used to treat cold limbs and extreme weakness associated with devastated yang. Cold Phlegm coughing and panting. Used to treat bleeding associated with cold obstructing the channels. Warms the Spleen and Stomach makes digestion better, as your digestion improves your health improves. Add as much or as little. Mellows out and increases effectiveness with cayenne. Use a spoonful to a handful per quart. Can combine with Fresh Ginger or other medicinal herbs and spices. Dried Ginger is Hotter than Fresh Ginger. Fresh or Raw Ginger (Sheng Jiang) promotes sweating and dispersing exterior cold. While Dried Ginger (Gan Jiang) is more effective in warming the Spleen and Stomach and expelling interior cold, and more chronic conditions. Ginger, Green Onion and Honey is great for colds, flu's, and a daily tonic. Optional herbal tea or Spices adds specific medicinal benefit. each package is 4 ounces. Using just a tablespoon per quart, equals roughly 8-12 quarts of brew. We have found each of selected herbs and spices add medical value to the art of brewing. You can substitute any of these herbs and spices in place of the Ginger, but we recommend to continue to use a percentage of Ginger (either fresh or dried) in each batch . see our full selection of medicinal herbs and spices.